The tragic events of the civil war in Sri Lanka and the scars it's left on its victims is a driving influence for painter, installation artist, film maker, and novelist Roma Tearne. This past June 15 she appeared before a packed auditorium at the National Gallery in London. The crowd had gathered to preview her short film, Letter from Urbino, and participate in the launch of her fifth novel, The Road to Urbino. As with her earlier works, these pieces are centered on the mental scars inflicted by the war. Although the two endeavors are related, the narrative of the film is different from the book, and while the film has the dreamy, somewhat haunting appearance of a hand-tinted postcard, the book rings with Tearne's trademark panache for crisp detail. A prominent member of the literary talent pool that has emerged from the Sri Lankan diaspora, she has earned an international reputation. This talented group includes Michael Ondaatje and Shyam Selvadurai from Canada, Roshi Fernando and Romesh Gunesekera from England, Michelle de Krestser from Australia, Ru Freeman in the US, and Shehan Karunatilaka, who lives in Singapore. In the 1960s, at the age of ten, Roma Tearne sailed with her parents from what was then Ceylon to start a new life in England. Her father was Tamil, and a poet, and her mother—who had been a journalist—was Sinhalese. Their families disapproved of the marriage, and so Tearne describes herself as "the child of a disgraced union, neither Tamil nor Sinhalese, born with a foot in both worlds." Although she has lived most of her life in the UK and has never returned to Sri Lanka, Tearne tells me "I am Sri Lankan. How could I be anything else? I look Sri Lankan, I was born there. My parents were Sri Lankan. But my loyalty and love is for the country that took me in." Before becoming a writer, Tearne trained as a painter and filmmaker at the Ruskin School of Fine Art, Oxford, followed by a time as Leverhulme Artist in Residence at the Ashmolean Museum in Oxford. She was then awarded a Fellowship in Visual Arts by the Arts and Humanities Research Council and worked for three years in museums around Europe on a project accessing narrative within the collections. This vast education and experience in the fine arts naturally leads to the question of whether she considers herself foremost an artist or a writer. "I am a writer! I have known since the age of five that this is what I am. Although it is an intensely solitary business and I am a gregarious person. So that is why I like making films because then I am problem solving with others. . . and having a laugh in the process. But in my heart I have always been a writer." Sri Lanka's rich literary traditions are thousands of years old. It's natural for Tearne to feel that being a writer is in her blood. "Two things happened in the last week that brought this home to me rather forcefully. The first was a letter I got from someone in Sweden who is writing a piece about me. He, the person, wrote saying that my novels reminded him of the poems written by a certain Sri Lankan man who he had once known. He had read the poems in the 1980s and only recently discovered that the poet had been my father. I was thrilled to hear this as it seemed proof to me that the family tradition was continuing. The second thing that happened was a story told to me by one of the actors in my latest film. He (the actor) was having a drink with a friend. This is slightly complicated... my actor's friend (let's call him X) said he had gone to Switzerland with a friend. In the hotel the night before she died she showed X the book she had been reading and told him: 'I've only read four chapters and I will now never know the end'. X then offered to read her the rest of the book. The book was Mosquito and it now sits on X's desk reminding him of that night. I was terribly moved and humbled to hear that someone should, on the last night of their life, be reading one of my books." Tearne's descriptions of Sri Lanka are intensely atmospheric, with palpable tropical beauty. When asked how she could conjure that in her head while sitting at her computer in Oxford, she replied, "when I left Sri Lanka at the age of ten I was very glad to do so. The place terrified me as a child. The anger that existed and continues to exist there (towards my parents and myself), the lack of rationality, the prejudice, the jealousies, they were scorched on my mind. As was the beautiful coastline where I used to go swimming with my father. I had a pretty sharply defined picture of the place and was never going to forget it." The Road to Urbino is a departure in both story and style from the author's earlier novels, and it's exciting to see her growth and development as a writer. But as always, there is Tearne's brilliant flair for painting word images, her concern for the victims of war, the restorative use of art in healing pain, her explorations of memory, and, of course, the settings of Sri Lanka, England, and Italy. As in her 2010 novel The Swimmer, in The Road to Urbino, Tearne moves away from the direct horrors of the Sri Lankan civil war, and instead focuses on the ripple effects the war has not just on its survivors, but also on the friends and family of those victims. This story of obsession, love, and art follows two protagonists. The first is Ras, a middle-aged Sri Lankan immigrant, as he awaits trial in London for stealing The Flagellation, an Italian Renaissance painting by Piero della Francesca. Ras tells of his early childhood in Sri Lanka, where his father mysteriously disappeared one night and his mother died in a bomb explosion. After years in a Tamil detention camp, he and his brother escape to England. Ras marries and has a child, and then divorces. Eventually he finds work as a gallery attendant at the National Gallery, where he is befriended by the charming and kind art curator, Charles. The second protagonist is Alex, a friend of Charles. Through Alex, we get a fuller picture of the life of Charles and his wife Delia. They, and their circle of friends, spend many fabulous summers in Italy, enjoying la dolce vita—art, food, companionship. Being a Roma Tearne novel, though, sad and tragic events occur that change everything. Everyone in this novel is consumed by a passion, wherein we find the source of most of the conflict. But all the characters are also scarred by war, even though the wars were thousands of miles away, or decades in the past. It is a book that the Independent says is "elegantly complicated." Tearne wrote her first book, Mosquito, working from memories of her childhood in Sri Lanka. In the novel, she artfully juxtaposes the horrors of the guerrilla war against the lush exotic beauty of the island. Theo is a grieving widower and writer who returns after many years in Britain and naively believes that he is immune to the political upheaval in his home country. He meets Nulani, a young painter who pulls him from his misery just as the war escalates. In the end, it is a story of the triumph of love and beauty. I have put this novel in the hands of at least ten readers, and so far everyone has praised it highly. Mosquito was nominated for the Kiriyama Prize and shortlisted for the Costa First Novel award. Yet despite these acclaims, neither Mosquito nor any of her other novels was well received in Sri Lanka. When asked about this, she replied: "Sri Lanka is a place of denial and shame. I cannot put it any better than W.G. Sebald—my hero—writing about Germany after World War Two, 'People's ability to forget what they do not want to know, to overlook what is before their eyes . . . to carry on as if nothing had happened . . . .' That is what is going on in Sri Lanka today. My books talk about that which is unmentionable." The author concedes that her second book, Bone China, is her most autobiographical novel, and she drew on her childhood memories to create one of the main characters. "I was a little like Anna-Meeka. Certainly I was a nightmare child!" This family saga follows three generations of the de Silvas as they slide from a prominent position in pre-World War Two Ceylon, through the Sri Lankan civil war, to life in current day London. As noted in an earlier review of Tearne's 2009 novel, Brixton Beach, in Belletrista, "once again [Tearne's] evocative language shimmers and quivers on the page as she beautifully transfers her artistic visualizations to the written word." The story is framed by the July 2005 terrorist bombings of London, and in between is the story of nine year-old Alice, who like Tearne is the daughter of both Tamil and Sinhalese parents. Like Tearne, Alice also immigrates to England, where she grows up to become an artist. The moral centre of the novel is Alice's Grandpa Bee, a gentle and wise character. Tearne says "Bee was an imaginary creation. I didn't really know my grandparents. Although having said that, a bit of my Dad crept into his character. " Brixton Beach was a selection for the UK's Channel 4 TV Book Club. With her fourth book, The Swimmer, Tearne pushes Sri Lanka to the background, and concentrates on characters in today's Britain—a country whose struggles are fraught with racism and right-wing politics. Ria is a 43-year-old English woman, living in semi-isolation in the Suffolk countryside. She meets Ben, a Sri Lankan doctor and they become lovers. While she is trying to help him navigate the frustrating process of attaining asylum, tragedy strikes. The effects of this tragedy echo through the lives of the women in Ben's life. The Swimmer was nominated for the Orange Prize. When asked if she was moving away from writing about Sri Lanka, or if she could see herself writing a book about Sri Lanka that didn't include the war, or imagine writing a completely non-Sri Lankan book, Tearne said "This is an interesting question. I don't know if I am moving away for good from Sri Lanka. It's hard to say at this point. My next book, the one I'm working on now, is about as British as you can get, I suppose. I think what is happening in my writing is that I am defining my preoccupations more clearly. I am interested in politics and what it does to the ordinary person, those people who really don't want to be involved in politics. These people still, somehow, get affected by external events whether they like it or not. I am also interested in the lack of love around the world, the shocking amount of violence and bloodshed that seems to exist everywhere." In each of her novels, Tearne returns to a series of themes. One of these is taking love where you find it; romantic relationships in her novels are sometimes unconventional: Theo and Nulani, from Mosquito; and Ria and Ben, Anula and Eric, both couples from The Swimmer. Commenting on what leads her to write relationships that make some readers uncomfortable, she says: "I am fascinated by the fact that there are people who become uncomfortable by so-called 'unconventional' relationships. Really what I am interested in is the nature of love and how it works on us all. For example, I know of someone (a Sri Lankan Singhalese) who is a lonely, single, middle-aged woman who nevertheless has turned her back on love because it came from a Tamil man. How crazy is that! Once when on a book tour in Australia I was publicly accused of writing about a pervert in Mosquito. I nearly fell off my chair! It's funny that it is nearly always women who say this. I'm afraid I told the person that her question said more about her than my characters. Is this harsh? I don't know. All I know is that human love is a fragile thing that has to be nurtured at all costs." The most pronounced theme is the lethal impact of war upon civilians, particularly the horrors of the civil war that ended in Sri Lanka in 2009. In her novels, she speaks for the voiceless, the mistreated, and the forgotten, and she gives an alternative narrative to that given by either the Sri Lankan government or the Tamil terrorists. She works with silences, half-hidden truths and self-deceptions. Although she eschews the label of "activist-novelist," Tearne admits that she is "interested in politics and what it does to the ordinary person, those people who really don't want to be involved in politics." Concerned that the West will willfully ignore both the past and ongoing abuses, Tearne weaves such events into her novels, where she releases the "unacknowledged skeletons buried in the deeply dysfunctional tropical paradise." The Sri Lankan government would like nothing better than to bury the memory of this war, but Tearne is doing her part to not let that happen. In her writing, she also tackles the struggles of immigrants. 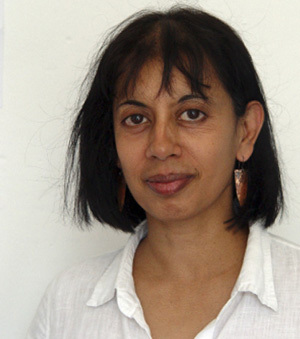 The Guardian says, "Roma Tearne has written perceptively and poetically about the experience of Sri Lankans living in Britain: " With her second novel, she began explorations into the consequent traumas of migration and exile to the UK. She explores memory and forgetting, and the cross-generational scars made by the burden of their loss. "As a migrant, you come to a host country and you think that your problems are over, but then you have to deal with other problems and carry inside you all the hurt from your home." Tearne says that her stories start from an idea. "Usually it is connected to an image . . . a photograph I have taken, or seen. Then I start having conversations in my head. I start one of my notebooks and at this point the story changes. It will change many, many times as I write. I usually write five drafts and when I look back at my original thoughts I am amazed at how far I have strayed. I do get to know my characters. I know what they eat, drink, etc." She was quoted in the Guardian saying, "My first love is for paints, and visually, and I suppose the novels always come from some imagery I've been working with." In order to express the redemptive qualities of art, in each of her books Tearne features a major character who is an artist, usually a painter or a musician. In writing these characters, she expresses the importance of creative forces in dealing with the agony of discrimination and violence. Through her ability to paint evocative word pictures, and her use of rich metaphorical language, it's obvious to the reader that Tearne herself is also a visual artist. Roma Tearne is a woman of high energy and many interests. She is regularly invited to participate as a panelist in various discussions on the overlap of literature and human rights, and she's written essays on social justice for The Guardian, The Independent, and other British newspapers. She also writes a blog, and she has even involved herself in the campaign to save the legendary London deli, Gaby's on Charing Cross Road. Most of her non-creative work, though, is working as an outspoken advocate for those caught in the humanitarian crisis in Sri Lanka. "It is time for the war crimes of the army to be made public, for truth and reconciliation, for international agencies to be allowed into the country; the nation must find it within itself to unite. For paradise cannot be regained by the sword." She's concerned with the Tamil people in Sri Lanka, the 95,000 who are currently displaced and the even greater number who lost everything. As she says, they have "suffered terribly. Led by a man who took his people to the brink of annihilation, persecuted by a barbaric government, they have suffered twice over." But she's also concerned with others in the country, those who have spoken against the government or who demand answers, and with the censorship of the press. I asked her if she expected the civil war to reignite, and she said, "Who knows? All I know is that the situation will not simply go away. What has been done to sections of the population cannot just be brushed aside. Look at Northern Ireland, at the Middle East. These things do not go away. Unfortunately there are no charismatic leaders in that country at the moment...as for example in Burma. Pity." She shares the opinion with Amnesty International that "ongoing impunity will also significantly hamper efforts at reconciliation in Sri Lanka and foster ongoing human rights violations, as the end of armed conflict has not ended human rights violations in Sri Lanka." In a country where the Defense Secretary recently made death threats against a journalist, and which blocks websites that it disapproves of and silences its critics, Tearne feels neither welcome nor safe. She has said that returning to the country is "not an option," and in the Guardian, she said she would not consider visiting her homeland "until the politics within the country changes; until the wrong that was done is redressed." When asked which of all her career endeavours she was most proud, she replied, "This is hard. Usually the thing I'm most proud of is the last piece of work I've done. So for instance, at the moment it is my latest book, The Road To Urbino and the film Letter From Urbino. In a few months as I get heavily stuck into my next book (I am working on the third draft of this) I shall forget all about Urbino and focus everything on this new book. However I have to say that the making of the film was hugely challenging and great fun. Working with a team of people (editor, actors, location managers etc) is hilarious . . . it is such a team effort. . .unlike writing a book, I mean." In her novels, Roma Tearne draws the world's attention to one of the world's underreported wars, and gives expression to the trauma and distress that ordinary citizens in this conflicted country, and in its diaspora, often feel. Whether it's Theo's capture by terrorists in Mosquito or Alice struggling to fit into a new life in grey, chilly London in Brixton Beach, Tearne tells their gripping stories with dignity and compassion. As the Independent says, she is "one of those writers who manage to interweave the political and personal to tremendous effect." Joyce Nickel is a corporate writer from Vancouver, Canada. When she's not reading or traveling, she can be found enjoying the outdoor lifestyle of the Pacific Northwest. Roma Tearne's novels are publishered by HarperCollins in the United Kingdom, and Europa Editions in the United States. These editions are distributed in Canada, Australia and New Zealand. Check your local or online bookstore for availability.